A blinding light, a white haze; so powerful it’s too much for her blue eyes to bear. They are so tightly shut, she can’t see what’s happening, but she can feel an enfolding warmth; two arms wrapped tight around her small body. “This warmth, where have I felt this before?” It brings an assuaging, almost nostalgic feeling to her. Like the warm hug a grandma would give to her grandchild. But Kairi, this small, charming, little girl, doesn’t remember having any family members, any place of birth, only the waves crashing against the shore of an island, an island that is her only place to call home. “Kairi…thank you...” this warm, familiar voice says. As the light fades, she is able to slowly open her eyes. She looks up at the boy who thanks her, the one who holds her so dearly. She knows exactly who this boy is. He’s the one who found her lying on the shore the day she arrived on that island. Who talked her though her confusion. Who helped her in every way he could. Who became one of her best friends. Who played with her nearly everyday. Who carved drawings with her on the walls of a small cave they called “The Secret Place”. Who searched worlds of the known universe in order to find her after she was lost. Who sacrificed his own life in order to restore her heart, and who she thought could maybe be the one she was destined to spend the rest of her life with, together as one, but could never tell if he felt the same way. “Sora!” she called out. “Sora!” Kairi jolted upward in her bed. Her eyes felt tired; she wasn’t able to go to bed until very late in the night. Suddenly, all the memories of what took place the night before rushed back into her head. She sees Sora, slowly shrinking into the horizon, stars erupting out into the black sky, from the light that surrounds him. She can’t make out what he’s saying, but she sees the smile on his face, that same reassuring smile he always gives her, and she knows in her heart that everything will be alright. She turned, laying a hand on her window, looking out upon the hills, the houses, the surrounding waters, and the island. The morning light was shining right through the trees that tower the small bit of land, glistening, creating a halo. “Sora…” she said slowly. After docking her boat, she jumped out onto the small wooden pier, walking down the stretch of sand that curved around the island. She could hear birds chirping, flying above her head. She saw the small cave next to the waterfall. “The Secret Place”. She ducked her head, walking through the hole that served as an entrance. She stopped to look at the entire cave, resting a hand on the wall made of rocks next to her. As she made her way inside, she notices the rays of light, shining down from a hole in roof of the cave. She smiled; the light always brought her a welcoming feeling. She slowly walked around the cave, scanning all the drawings she and her friends have made; her left hand grasping her right wrist behind her back. She laid a hand on one of the drawings, scraping it across the wall as she moved along. Her hand stopped on the drawing of some hair. With wonder, she looked closely at the entire drawing. She saw a drawing of Sora, and herself, facing one another. She remembered drawing this when she was very young. But something was different. A new drawing she had never seen before; an arm stretched out from the drawing of Sora, towards the drawing of herself. In his hand was a paopu fruit, the fruit that is said to intertwine two people’s destinies together if it’s shared, to make them one, two halves of the same whole. This feeling, this overwhelming, colossal feeling rushed through her body, a feeling she had only tasted, at moments throughout her life, but now were made true and pure. She had always wondered, but now, she knew for certain. Sora loved her, just as much as she loved him. I want to give proper recognition; the line that says "Sora loved her, just as much as she loved him." was inspired by a comment I saw on a youtube video called "Sora x Kairi hints part 2". The user's name is KHKHLOLZ234, and he or she wrote, "She loves him as much as he loves her." 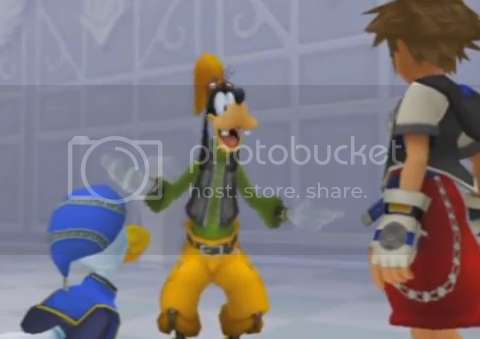 “Kairi!” Selphie called out. Kairi was staring at the island, from the shore of her homeland. She didn’t even hear her. Only one person was on her mind. Selphie ran over to her, stopping right beside her, hands on her knees, panting for air. “Kairi (breath) we thought we lost you again!”. “Well, I was separated from Tidus and Wakka at first, until they found a way to reach me! They were on a world called Spira. Then, they came to the world I was on, Balamb Garden. After some time, we all suddenly came back here, our original home. 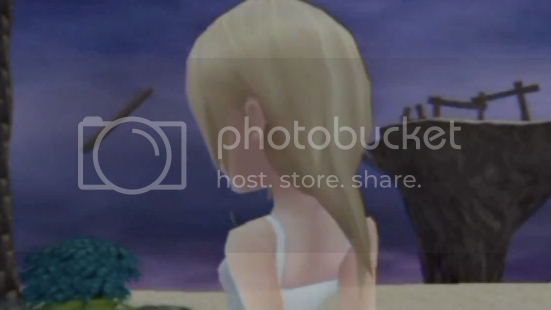 “I see…” Kairi said, looking back at the island. All the memories of what had happened suddenly rushed back into her head. She lowered her head, and stares down at the sand. She couldn’t contain the sadness she felt. 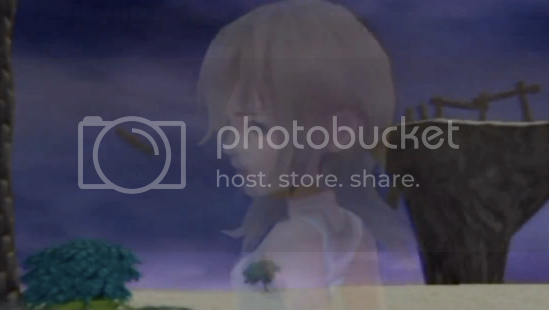 She knew Sora and Riku were out there, somewhere in the wide expanse of starts that make up the sky. But she had no idea where. A tear slowly ran down her cheek. Kairi looked back down again. Selphie could sense Kairi’s sadness. She leaned in, and laid a hand on Kairi’s shoulder. Kairi looked back up at her. “Hey! Follow me into town, there’s something I wanna show you!” Selphie said. Kairi nodded with a smile, and then, the two ran up the trail that extends into town. They made it to a small plaza, where some small stands and shops surrounded. “Wait here, I’ll be right back!” Selphie said. “’Kay,” Kairi said with a nod. Kairi looked around the plaza. She never took much time to notice all its small details. It was so peaceful and tranquil, not as busy as Traverse Town. Suddenly, the memories of her time at Traverse Town came rushing into her head. “Oh?” Kairi opened her eyes, turning around to see Selphie, with two blue ice cream bars in each of her hands. Tidus and Wakka are standing on either side of her. Tidus was holding the same red stick he’s had for years, and Wakka was holding the blitzball he was always playing with. “Hey Kairi!” they both said. Selphie handed them both an ice cream bar, and then one to Kairi. “Okay, let’s go!” Kairi said. They all turned, heading towards the hill. When they reached the top, they turned to face the sun, then took a seat on the grassy hill. Sundown was approaching, and the streaks of orange light were shining out on the entire land. They reflected off the water, sparkling on the small waves that crashed upon the shore. She saw the island again, the rays of light shining right through its trees, making a halo. Tidus, Wakka, and Selphie were all taking to each other, but Kairi paid no attention to anything they were saying. “Salty…but sweet, I like it!” Tidus said. “Yah man, dis is really great!” Wakka said. “Hehe-I knew you guys would like it!” Selphie said. arms. She closed her eyes, as a light breeze ran through her hair. “Yeah! Hey, you know, since it’s summer, and school doesn’t start for another three weeks, I think we should do this every sunset. We could all buy ourselves ice cream, and eat it together on this hill,” Selphie said. “Yeah! Let’s do it,” Tidus said. “Alright, then it’s settled. For the rest of the summer, we’ll come here and eat ice cream,” Selphie said. Kairi was still looking out at the island, but she could hear what they were saying. She took another bite out of her ice cream. “Don’t ever forget. Wherever you go, I’m always with you…” Kairi thought to herself. Tidus and Wakka were running back and forth on the blitzball field, right outside the school ground. Kairi was walking down the parallel road by herself, her left hand grasping her right wrist behind her back. When she noticed the two, she stopped to watch, smiling as she leaned on the fence that surrounded the field. Tidus kicked the blitzball towards the end of the field. “Haha!”. Quickly, Wakka ran across the end, leaping over to intercept the ball. He dove into the ground with a roll. “Haha, almost got it in dat time!” He said. The two stopped, walking towards the center of the field. “Nice one Wakka,” Tidus said with a smile. Kairi smiled at the sight. She never spent much time watching Tidus and Wakka play blitzball, but after such a long time, she appreciated something as subtle as this. She looked over again, and noticed something on the other side of field. There was a man, leaning against a tree, staring down at the ground with his arms crossed. He was wearing a red cloak and mantle, over black underclothes. He looked very tall, and had on a red bandana, over long black hair. 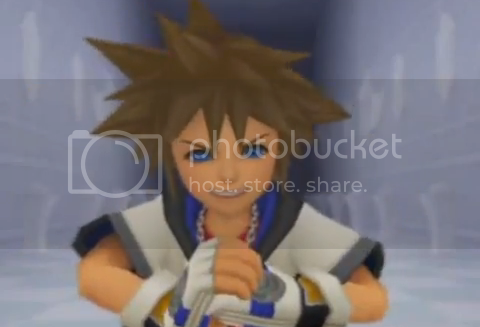 From far away, Kairi couldn’t see his face very well, but noticed a golden gauntlet on his left arm. “Huh?” she said. She’d never seen this man before. “Maybe a new-comer to the island?” she thought. “Oh?” Kairi turned around to see Selphie. “Hey! Do you wanna head out to the island today?” she said. “The island…” Kairi said to herself. She turned around to looks towards it. She wanted to spend time with her friends, but going out to the island reminded her of Sora and Riku; and how much she missed them. At first, she was reluctant, and hesitated. But she dropped those feelings; she knew it would be all right. “Okay!” she said with a smile. “'Kay,” The two went opposite ways. As Kairi began walking, she looked over at the field again. Tidus and Wakka were gone, and so was the man. “I wonder who that was,” Kairi said to herself. On the island, Kairi and Selphie were sitting on the sand, watching Tidus and Wakka play in the water. They both giggled. “Those two are something else,” Selphie said. “Haha, yeah” Kairi said. She looked at them again, but she didn’t see Tidus and Wakka. Instead, she saw Sora and Riku; playing like they always do. Always competing with one another. They were fighting, wooden swords in hand, laughing at the same time. “C’mon Sora, I thought you were stronger than that!” Riku said. “Get real! Look which one of us in winning!” Sora said with a grin. They both laugh, and Kairi giggled to her self. “Huh?” Kairi looked over at Selphie, then back at the water. She saw Tidus and Wakka once again. Kairi smiled, and looked out at the water. The afternoon was entering its latter time, and the rays of light began to shine even bolder, making a more apparent reflection on the water. She listened to the sound of the waves crashing on the shore. “The memories…” she thought to herself. She could never forget all the memories she made with Sora and Riku, all the memories that were so deep within her heart, never. “Huh? What does that mean?” Sora said to himself. Kairi couldn't see anything; just a never-ending darkness all around her. "Where am I?" she thought to herself. It was like she was going blind, but no, she could see herself. She turned around, and saw a small speck of light in the distance. She could barely make out what it was; it took a while for her to fully focus in on it. She was able to make out the shape of a person, a girl, in a small, white dress. The girl seemed to be moving; turning around. She looked closer, and saw a head of blonde hair, and two blue eyes, looking back at her. They looked just like her own. I like the concept fo this story. I always wondered how Kairi felt about forgetting Sora. Although it was a little odd to see the story written in presence tense, it still works. I'm looking forward to more. Kairi woke feeling refreshed, and full of energy. She leaned up in her bed, and looked out the window. After taking a long look at the island, she smiled, threw back her covers, and rushed out her room. After docking her boat, she took a few steps forward and looked around. She noticed the small waterfall, and “The Secret Place” behind it. She hopped down, and ran over to it. When she made her way inside, she looked around again, like she did the morning after coming back to the island. She saw the carving of her and Sora giving each other the papou fruit, and placed a hand on it. She smiled and let out a sigh. She looked to her left, and then up at the door, the one with no lock, no knob, just a wooden surface. She stared at it, taking more time to observe it then she had before. In an instant, she began to feel uneasy, and fell to her knees. “Uh..err…” She was squinting her eyes, as she grabbed the side of her head. There was a sharp, intense pain growing inside it, but she had no idea why. She closed her eyes completely, and saw something she had never seen before. She recognized Sora’s voice. She was seeing everything in first-person, but she couldn’t control her movements. She was staring at the wooden door, then, she began to turn. “Sora…” she heard herself say. She saw Sora, staring back at her, looking confused and worried. She began to slowly reach out her hand, but a strong force swept her off her feet, sending her flying towards Sora. 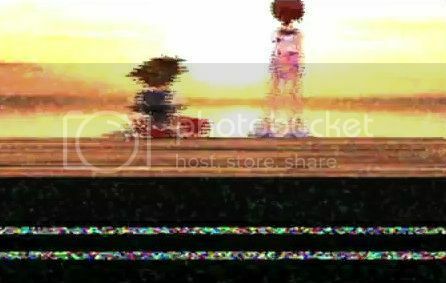 Sora opened his arms to catch her, but right as they were about to collide, her vision went black. “Huh…?” Kairi said slowly. She began to open her eyes, and her blurred vision began to clear. She saw Selphie, Tidus, and Wakka all staring down at her. Kairi sat up, and rubbed her eyes. Selphie was hanging on to her arm. “Are you okay? !” she said. “We went all around the island looking for you! When we came here, we found you lying on the floor.” Tidus said. “Really? You must be tired then…want us to walk you back home?” Selphie said. 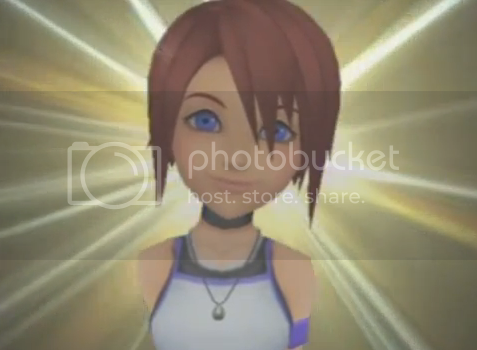 “Sure…thanks you guys” Kairi said with an uneasy smile. She slowly stood up, wobbling as she found her balance. They all started walking back out. When it was Kairi’s turn to climb out the exit, she turned around, and took another look at the door. “What was all that?” she thought to herself. A white, empty room; calm and tranquil, with just the slightest bit of sound. 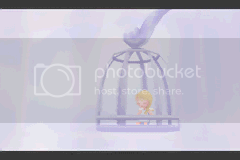 There’s a small cage in one corner, resembling that for a bird, and a small doll inside of it. It’s a blonde girl, in a white dress, smiling, sitting peacefully in her entrapment. All you can hear is the faint scribbling of a pencil on a notepad. This sound is coming from a small girl, who looks just like the doll, sitting in a chair alone, happily drawing away. She brushes the drawing off with her hand, and sets it down on the table in front of her. It’s of a large castle. “So, did you call for him?” a man’s voice says from across the room. There is a moment of silence, as the man thinks through what the girl said. A red flower petal slowly makes it way downwards; swaying left, and right, until it eventually meets the ground. "Yeah I heard some other kids talking about him too! They say he wears a golden gauntlet on his arm!" Tidus says. Kairi looks back up with surprise when she hears him say that. "What? That's crazy" Waka said as he takes another bite. “You know Kairi-he really did look everywhere for you,” Leon said. Kairi looked down at her feet, with a nervous smile “Hehe-really? “Yeah! The first time we found him, he mistook me for you! He even told me how glad he was that I was okay and everything!” Yuffie said. “He was always talking about finding his friends, and going back to the islands together,” Aeris said. Kairi couldn’t stop smiling. She was flattered by what she heard. “If you ask me…I’d say there’s a strong bond that ties you to each other.” Leon said. Kairi looked up at the night sky, as a shooting star ran by. It was the gummi ship, heading back to Hollow Bastion. “Huh?” Kairi turned around slowly, still dazed and confused. She saw the blurred image of Selphie running down the trail that runs through town. “Yeah…I’m…I’m just a little dizzy…it’s no big deal” Kairi rubbed her head. 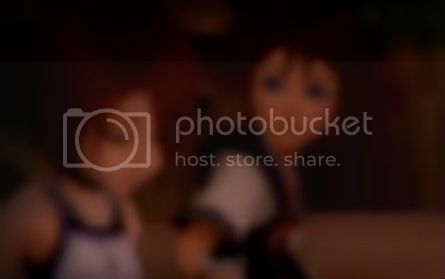 “Umm…sure” Kairi wasn’t totally paying attention. She was lost in her own thoughts. She felt there was something wrong, like something was happening, beyond her control. Selphie wasn’t convinced; she gave Kairi a confused look, while Kairi looked back down at the ground. “So what if a person without a heart is destroyed-a Nobody like you or me? Does some part of us remain? '“As if. We’re not even suppose to “be” in the first place. What’s there to leave behind? he felt. If Axel was that person, then that means he would never see him again. “Oh…” he said slowly. Xigbar turned and looked towards the dark corridor. Xigbar walked through. As Roxas began to step forward, a sudden pain rushed through his head. He squinted his eyes, dropping his knee as the sharp pain intensified. “Huh?” Kairi turned to see Selphie, smiling back at her. The two were sitting on the sand, watching the waves sway back and forth on the white sand of the island. and the star shaped fruit that hung from it’s top. “Errr...” A sharp pain suddenly ran through Kairi’s head. She squinted her eyes, grabbing the side of her head. Kairi tried to focus in on what was going on, but before she could do anything, she was unconscious. Kairi sunk into the very depths of her heart; into the very stillness of its quiet sanctuary. It was a scattered dream, that's like a far off memory. Or perhaps, a far off memory, that’s like a scattered dream. It was in this place, that Kairi could here the faintest sound, a voice, that was both as far as the worlds among the stars, and as close as the waves that crashed beside her. It was the voice of a boy. 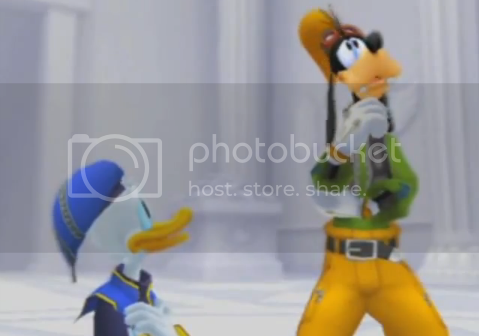 Goofy rested a hand on his chin, confused in the same way Donald was. He was just as unable to give an answer. Footsteps tapped on the roof of Twilight Town’s bell tower. A girl in a black coat slowly stepped towards the edge, and sat down. She looked out at the landscape before her. 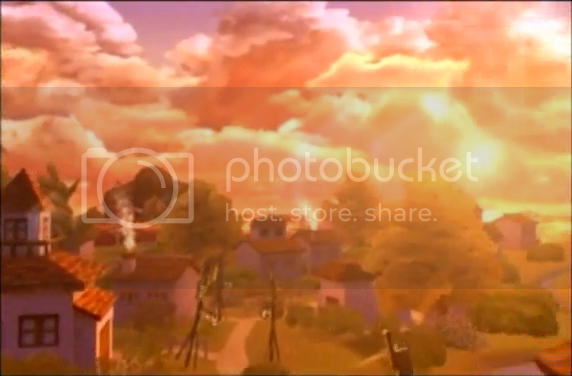 The sun was nearing dusk, and the orange rays shined through the surrounding hills, down upon the town beneath. She could hear the whistle of a train going down the tracks; the roar of its engine as it let out its smoke. 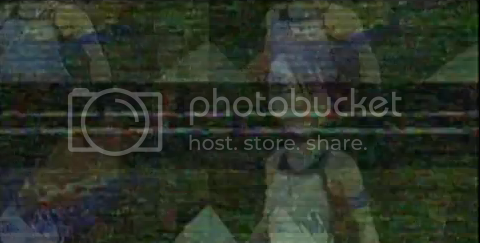 Pretty good, adding the picture of Sora all blured was a nice touch. And so was the scatered dream, and far off memory lines. I may add this to the critique group's to do list but for now, I wanted to make a note that with dialogue and thought snippets you still do need to make a new line. I may do a small critique of the first day to show what I'm talking about. There are also multiple times where you can make a new paragraph line instead of continuing in the same paragraph. This took less time than I thought. A blinding light, a white haze, so powerful it’s too much for her blue eyes to bear. They (1) are so tightly shut, she can’t see what’s happening, but she can feel an enfolding warmth; two arms wrapped tight around her small body. I'm going to start off by saying I personally really hate present tense. And you switch in and out of it a lot making it really hard to read. I seriously suggest just sticking with past tense, it makes things so much easier on everyone because the present tense narration isn't really working for me especially when things switch around like they do. She clenched her eyes tightly and couldn't see what was happening, but she could feel an enfolding warmth; two arms wrapped firmly around her small body. And some just leave it normal. Regardless, it'd be separated from both the first paragraph and the next one. Quotation marks however just suggest she's saying it out loud. I'd like to think she isn't, but, you know. (2) This could probably be kind of switched around a bit to be like “...family members, or even a place of birth; just waves crashing against the shore of an island. The island felt like home to her.” or, something. “Kairi...[SPACE] Thank you...” this warm, familiar voice says. “this” kind of sounds weird is all. (1) This is why I say use past tense, because he just thanked her. It really just makes a mess for you as the writer and to the reader which you definitely don't want to do. (2) Try to avoid using the same word to begin a sentence, especially in a row. It gets repetitive so it's best to avoid it unless it's for style reasons, which in this case, it is not. (3) This is an incredibly long sentence that can be rewrote so much better. There is a lot of feeling in this sentence but it can still be broken up to help show that feeling. (4) I'm conflicted because I feel like Kairi can show emotion a lot better here. You're ending on this note. It could be as simple as just having it as “Sora!” and no action phrase, just that... or you could show emotion by having her smile, or yell to him or something of that sort. I hope I was of some help. Overall, it was enjoyable, but you need to definitely work out the kinks I noted like the tense changing and general wording stuff. Work on that final sentence before Kairi says "Sora" too because there is no reason for a sentence to be that long. But yes, I'm hoping I helped just a bit, I'm sorry if I came off rude, you definitely have talent and potential you just need to work on some things. Also wow I never noted how I like how you posted these. The images and spoiler boxes allow for a good broken up way of telling things. It's nice. I just wanted to comment on the first day since it had some issues. Thank you so much I'm happy to hear you enjoyed it. 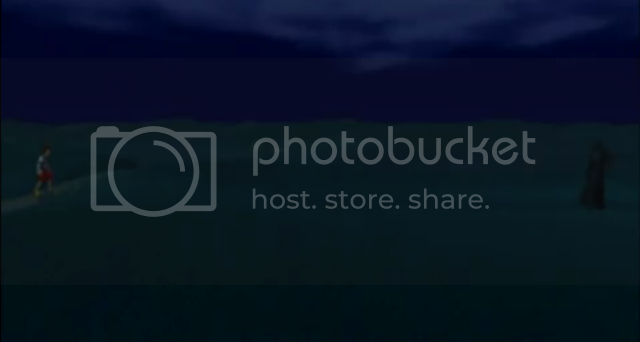 I was excited about posting the pictures, and that line as well. When I got to that part, I think I might have been drawing inspiration from the idea of the long distance, and oblivion they both felt. The line fit with that idea; a "scattered" dream, and a "far off" memory. Kairi woke feeling refreshed, and full of energy. She had a smile on her face, as she sat up in her bed. She turned and looked out her window. The morning rays were shining through the glass, and onto Kairi’s bed. She threw back the covers, and rushed out her room. “Sure! No problem” Selphie smiled back. “Hmm…my parents are taking me school shopping today, but maybe we could go after? “Bye!” Kairi waved goodbye, as her friend walked down the trail, into the horizon. “Yoo-you sure I’m doing this right?” Wakka said. He was sitting with his right leg curved over his head, arms stretched straight out. “Yeah! These stretches are sure to get us in his shape for the games!” Tidus had his back curved on top of rock, trying to bend it even further. “Hey guys! Do you wa….uh…what are you doing?” Kairi said walking up to the two boys, with a confused look on her face. “Getting in shape for the games!” Wakka said, oblivious to how silly the two of them looked. “Can’t. Gotta keep training” Tidus said bluntly, as a crack could be heard from base of his spine. Kairi was still confused, but didn’t make any effort to persuade. “Uhh, I don’t know Tidus. I think we’ve done enough training for today” Wakka said, getting out of his awkward position. “See ya Kairi!” Wakka said. “Bye!” Kairi said, waving as she walked away. Kairi made her way down the trail, then ran out to the shore. She noticed something. She slowed down, and stood still, staring at the man who was standing there, staring out at the water. It was the man she’d seen before. His red mantle, and long black hair were swaying in the wind. The light reflected off the gauntlet on his arm, making it shine. Kairi was hesitant, and not completely sure what to do. She wanted to ask him who he has, if he was from the islands, but she wasn’t sure if it was the polite thing to do. “A fruit that brings together people’s destinies...if only…” he said, still looking out at the ocean. He threw the star-shaped fruit aside, and turned around to walk away. Kairi looked up at the man’s face, getting clear glimpse for the first time. His red eyes lacked any sign of emotion. He simply walked past her, without looking down. Kairi went over to the fruit, and picked it up off the ground, holding it in her hands. She stared down at it for a long time, thinking over what the man said. An enfolding warmth came over her; giving her an assuaging, almost nostalgic feeling. It was so strange to her. “Why do I feel this way?” she thought to herself. A tear ran down her cheek. “Huh? That’s weird…” she said, wiping it from her face. “Kairi!” Selphie called out, running towards her, along side Tidus and Wakka. Selphie stopped in front of her, noticing the papou in her hands. “Oooh-what are you doing with a papou fruit? Thinkin’ about sharing it without someone?” she teased, leaning in towards Kairi with a smile. “…Am I?” Kairi said, looking down at the fruit with confusion. “You tell me!” Selphie said with a smile, leaning back out. “C’mon!” She said, running towards the wooden boats that were docked near the shore, followed by Tidus and Wakka. Kairi remained still, looking down at the fruit. She thought it over again, but realized there was nothing, rather nobody, on her mind. “Must just be my imagination” she said, dropping the fruit, and running towards the boats. The four of them rode out towards the island. The sun was glistening on the water, making reflections on all its small movements. Kairi watched the mainland slowly getting smaller, and smaller, as she rode away from it. She took one last look, then turned around. 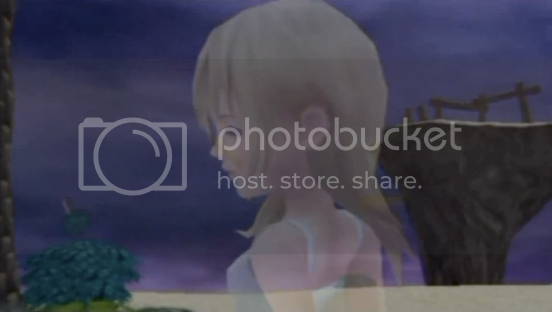 Xion sunk her head, and slowly walked away. She couldn’t understand the feeling she felt, but she felt it nonetheless. A lump in her throat, and a tightening in her chest, right where a heart would be, if she even had one. Xion walked back over to Saïx. He looked down at her, with the lack of emotion that constantly hung on his face, then back up. “Oooh-kay! Independent study time!” Selphie called out. Tidus, Wakka, and Kairi were all lined up, facing Selphie. “Right!” Tidus said with a nod. “No problem!” Wakka said, putting up a fist. “’Kay” Kairi said with a nod. The three of them nodded in return, and went their separate ways. It was well into the afternoon. The sun was shining down on the island, heating up the sand, making the ocean water clear enough to see the floor beneath it. Kairi walked along the shore, beginning her search. After about a half an hour, she had a well-sized handful of seashells. She walked over to the wooden bridge that connected the smaller island. Once she made her way across, she set them down in a pile, right next to the papou tree. She turned around, making her way back to the shore. “Yoo-Tidus? Have you found anything yet?” Wakka was looking through the bushes that surround the small waterfall. “Not yet!” Tidus called out. He was standing in the small pond, staring down at the water, right below the waterfall. The two of them heard some shuffling in the distance. “Hm? Did you here that?” Tidus asked. They both stopped what they were doing, and looked up, listening closely. “I don’t see anything…” Wakka said. They waited a couple seconds, without moving. “Must just be the wind or something” Tidus said, as the two of them went back to their search. 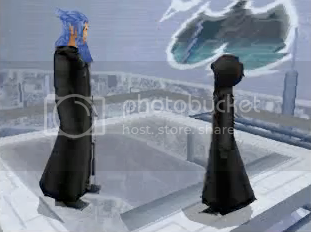 “Xemnas…her memories were wiped clean…is that right?” Saïx was leaned up against a wall, his hood covering his face. Kairi looked down at the sand. She noticed a small thalassa shell, right below her feet. She smiled, picking it up. It was one her favorites to collect. Kairi shook her head, walking towards her. “This is so weird! I know I put it inside the book, but now, I can’t find it!” she said. Kairi took a quick look around. “Oh-there!” Kairi pointed over to the dock. The log was leaning against the wooden stairs that led up to it. Selphie looked up at the sky, trying to feel a breeze. She couldn’t remember the last time she felt the air so still. “Hold still little fish!” Tidus was holding a small camera, pointed down at the water. He was struggling to get a clear shot. “Ey, we have to check in with Selphie now” Wakka said. “Huh? !” Tidus looked up with surprise, accidently taking a picture of Wakka. He looked back down at the water, to see no fish. “Hey guys, how’s your search been so far?” The two of them looked over to see Kairi, walking towards them. “C’mon, let’s check in with Selphie” she said, turning back around. The four of them laid their findings out across the sand. “What? Let me see” Tidus said. All three of them huddled around Selphie, looking down at the small photograph. 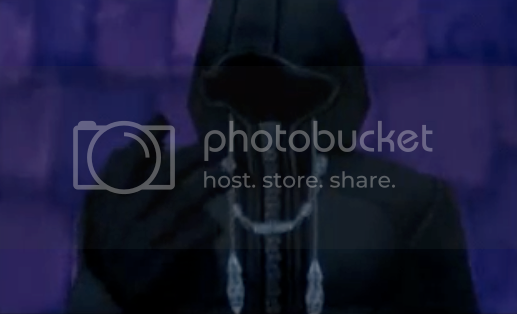 On it, was the picture Tidus mistakenly took of Wakka. It was a bit blurred, and titled to the side. On the right, was Wakka, standing in front of the camera, on the ledge that curved around island, leading into The Secret Place. On the left was the shore of the island, and the ocean, stretching out into the horizon. Behind Wakka’s shoulder, out into the distance, was a large, door-like makeup of darkness. A dark corridor, in mid-formation. “Ey…I never saw dat…” Wakka said slowly. “What do you think it is?” Selphie asked. “I don’t know” Tidus said without interest, sitting back down across from Selphie. Selphie looked up, to see Kairi, shuffling through her seashells. 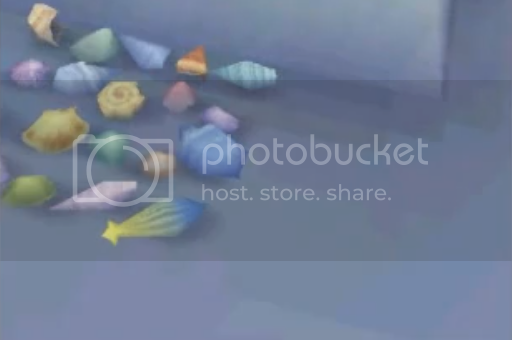 “I found a thalassa shell earlier…and now…its gone!” Kairi said, leaning back, with a sad look on her face. The four of them were silent, noticing how troubled Kairi was. shoulder. She looked up, to see Selphie looking back at her. 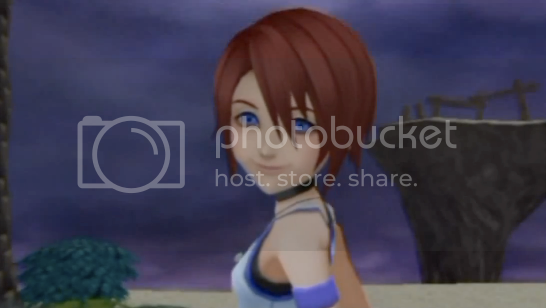 Kairi smiled, knowing exactly what that meant. Xemnas said nothing in return. Xemnas took a long pause, before speaking. “Eventually….the puppet will play her part” he said slowly. The orange sun shined bright upon the mainland, glistening over the water, making a halo through the trees of the island. The four of them were sitting on top the grass hill, eating their sea-salt ice cream. Kairi was staring down at the ground, stilling mulling over the fact that the shell she found disappeared. "Yeah I heard some other kids talking about him too! They say he wears a golden gauntlet on his arm!" Tidus says. Kairi looked back up with surprise when she heard him say that. “I don’t know…some mysterious man. No one has any idea who he is” Tidus said. Kairi looked up at the sky. It’s been a few weeks since the last time she saw him. “A fruit that brings together people’s destinies...if only…” He threw the star-shaped fruit aside, and turned around to walk away. Kairi looked up at the man’s face, getting a clear glimpse for the first time. His red eyes lacked any sign of emotion. He simply walked past her, without looking down. “You know guys, we only have a few weeks before school starts!” Selphie said. “Oh man! I’m scared…” Wakka said. “Yeah…I kinda am too” Tidus said. Kairi looked over at the three of them, with a reassuring smile. She turned, facing them. “What you said back there kinda got brain...uh…thinkin’. Whenever you make a promise that’s super duper important, maybe it gives you the courage to face the scary stuff!” Goofy said. “Alright! Let’s do it!” Selphie said, getting up off the ground. “Hehe. Even if we get scared, or in trouble, or even if we get separated!” Kairi said. She stuck out her hand, followed by the others. 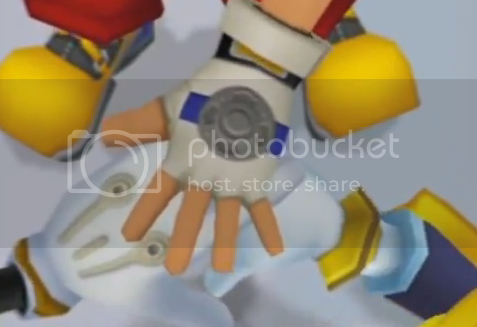 “Whatever happens, we’re friends!” Sora drove a fist into his other hand. He let go, and placed a hand on top Donald and Goofy’s. “All for one, and one for all!” Donald yelled out. “All for one, and one for all!” Selphie called out, her hand resting on top her friend’s. They all smiled, feeling the confidence of their newly made promise. They turned towards the landscape, watching the sun make it’s final descent into the waters. The stars were beginning to appear, one by one, high above the sky. If you watched closely, you could see one in particular, shining brighter than the rest. 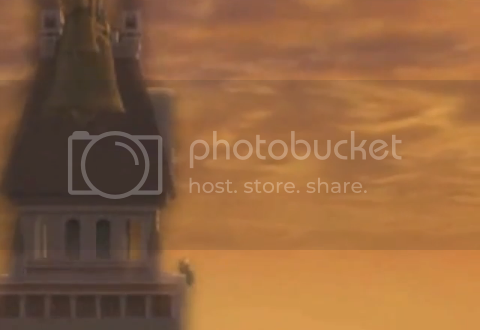 It was Castle Oblivion, where Sora was about to face Marluxia. Footsteps tapped along the hallway of the castle. A door slowly creaked open, as Xion walked over to Roxas’s bedside. She brought down her hood, smiling down at him. In her hands, she held a small thalassa shell. DiZ and Namine turned around, looking at the young voice that called from behind. They took a long look at his change of apperance. “Your eyes can’t lie, can they?” DiZ said. Sora smiled. Even though he couldn’t think of who this person was, the things he was hearing were more true than anything else in that moment. Kairi slowly made her way down the trail that lead through the town’s gardens. She stopped, looking up at the morning sky. A light breeze ran through her hair. She could see the petals of wind slowly float by, carried off into the distance. Without reason, and without warning, a sudden, warm feeling ran through her. She closed her eyes, and smiled. Kairi turned to see Tidus and Wakka running down the trail. They made their way to her, panting and out of breath. Tidus looked up first. “We don’t know…” Wakka said, looking down at the ground. “Nope. We’ve checked almost everywhere” Tidus said. “That’s where we’re going now. Can you come help us?” he said. “Of course! Kairi said with a nod. She followed the two of them down the trail that led into town. “Greetings kupo, you look like your lookin’ for someone. 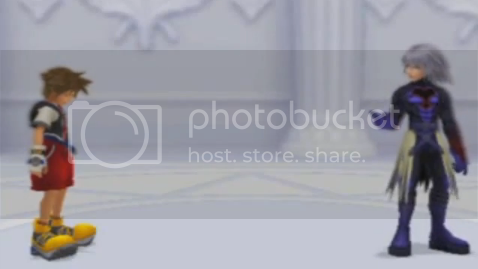 How about somethin’ from the shop to help then, kupo. C’mon, whattya say, kupo?" Kairi, Tidus, and Wakka were all staring back at the little moogle, without the slightest bit of interest in buying anything. “Have you seen a girl, about dis high, with brown hair and a yellow dress?” Wakka asked. “Thanks anyway” Kairi said, walking off with the rest of the group. The three of them walked around the entire plaza; asking all the different shops, looking everywhere they could think of. “Man, where could she be?” Tidus said. “Huh? !” The three turned around, to see Selphie, smiling and laughing, holding her hand out towards a baby chocobo. She turned, looking back at her friends with a smile. “Hey guys!” she waved over at them. She was standing in front of a chocobo breeder’s stand. “Where’ve you been? We’ve been looking all over for you!” Tidus said. “Oh, really?” she had a surprised look on her face. “I got up this early this morning. After taking a walk around the town, I came here, to check out the baby chocobos, see?” She bent down, petting it on the head. “Aww, so cute!” Kairi cheered, leaning into the pet the tiny chocobo. “Wark!” it called out in a tiny, high-pitched voice. The four them giggled. The two of them got up, following Tidus and Wakka back into town. The sun’s afternoon rays were shining bright upon the town’s trail. Selphie and Kairi were walking together, behind Tidus and Wakka who were far ahead of them. “Hm?” Kairi turned to look at Selphie. Kairi looked down at the ground. She knew exactly what she meant, much to her surprise. It was like her words were speaking to apart of her she didn’t know. “Hehe. I guess…” Selphie looked back at Kairi. “If our memories are lost in the dark, then each of us can be the light that brings them back! Especially with our promise” Selphie smiled and turned back around, continuing her walk down the trail. Kairi stood in place. She looked up at the sky; at the sun that was shining down upon her. “The light that brings them back…” she thought to herself. “C’mon Kairi!” Tidus called out. Her friends were far ahead of her on the trail. “Oh-” She looked back down. “Coming!” she said, running over to them. The sun was inching closer to its orange tone of dusk. Petals of the wind flew by, carried off into the distance, landing softly in the gardens of the mainland’s town. Tidus and Wakka ran ahead along the shore of the mainland, followed by Selphie. She turned to look out at the shore, and noticed someone standing there, looking out at the ocean. 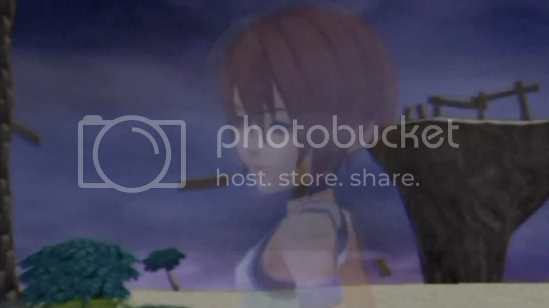 It was Kairi, all alone. She stopped, and walked over to her. Her eyes were closed, and her hand was held close to her chest. Selphie was surprised by her sudden trance. She opened up her eyes, and looked out at the island. Kairi looked back out at the sea. She couldn’t think of anything to say. She just stared out at the sea, and the sun, approaching dusk. Kairi smiled, and nodded. The two of them turned, and started walking back. Kairi kept walking, but turned to face the island. The light of sunset shined bright upon its trees, and glistened on the water that surrounded it. She gave a faint smile, then turned back around. A star-covered night sky hung above Kairi’s head, as she walked back to her house. She reached the front porch, and opened the door, stepping inside. “I’m home!” she called out. “Huh?” Kairi said to herself in confusion. She looked down at the ground, where a small package was lying on the floor. There was a note attached. Kairi, sorry to leave you alone for the night, but town hall’s meeting should be running late. Supper’s on the table, and I’ll be back by morning. Your school uniform came in today! Sleep well, and do take care. Kairi smiled, and opened up the package, looking inside with wonder. She reached inside, and pulled out a white collared shirt, holding it up in the air. She looked inside again, and saw a blue skirt with a plad design, a matching tie, two black shoes, and dark blue socks. Saïx looked up, setting down the pen and small journal. Saïx closed the book, setting it inside a small drawer with the pen. He got up, stepping out into the hallway. 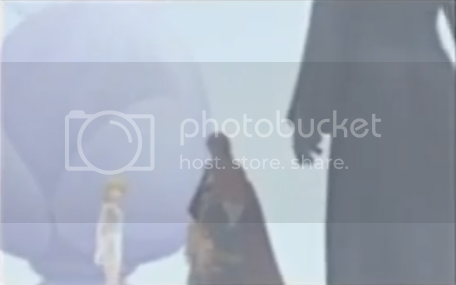 Ignoring the comment, he looked up at the large pod, where Sora was floating in a peaceful slumber. “He is stable, and progressing steadily. However, much still hangs in the balance.” DiZ said. 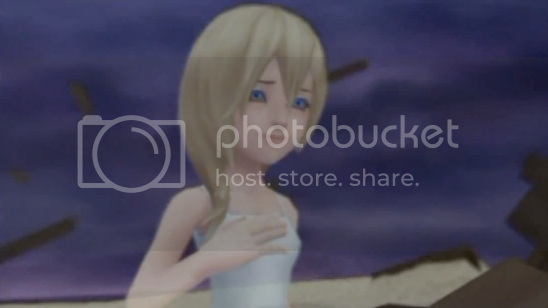 Namine took a few steps forward. She looked down, keeping her hands close together. “The Organization is at work” DiZ added. Kairi twirled around, looking in the mirror; wearing her new uniform. She looked up at her hair, running her fingers through the back of it. It was starting to gain a bit of length, much to her surprise. “Kairi!” The voice came from outside. She went over to her bed, climbing on top, and opened up her window, looking outside. The morning breeze ran through her hair, as the sun shined bright upon the islands. She looked down, and saw Tidus and Selphie, standing in front of her house. They were both wearing their school uniforms. Selphie held a small white purse, laced with pink, holding a keychain of two golden stars, and one of a small moogle. Tidus had a small blue backpack held over his shoulders. “Hey guys!” Kairi waved, looking down at the two of them cheerfully. “Hurry Kairi! We’re gonna be late!” Tidus said. “Kay” Kairi nodded, going back inside, then downstairs, grabbing her badge-colored purse, then heading out the front door. She ran up to the two of them, and followed from behind as they walked down the mainland’s trail. “Hmm…” Kairi looked up. “No idea” she said, looking over at her. “Eyy!” Wakka called out from afar. He was farther ahead on the trail, waving at them. “Wakka! How you feeling man?” Tidus asked. Wakka stretched out his collar, right above his loosened tie. “Uncomfortable brudda…” he said with an uneasy look on his face. The three of them laughed, looking up at the building ahead. 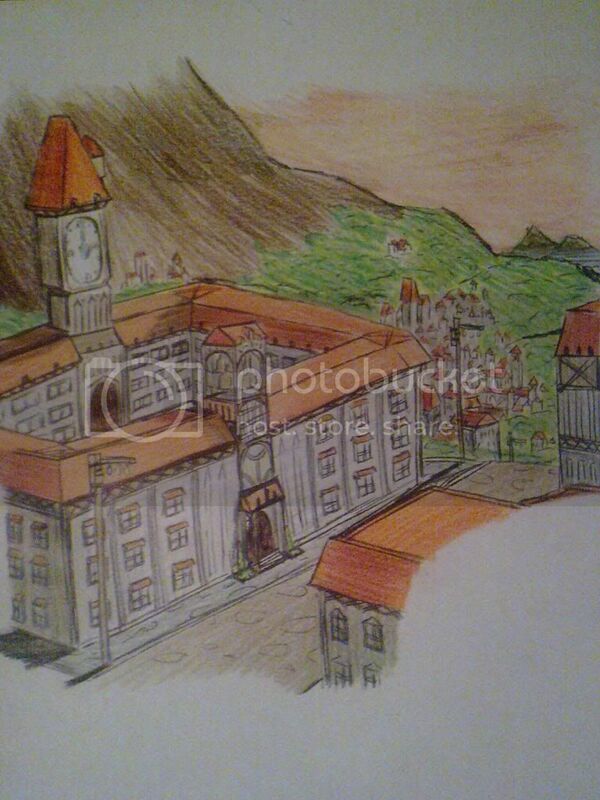 Destiny Islands Academy. 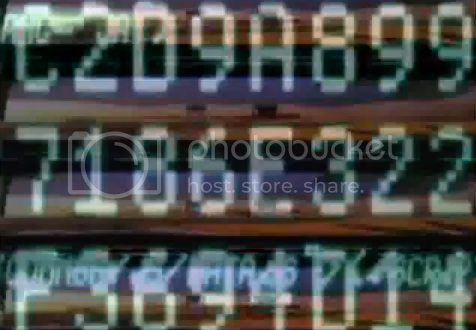 The beeps and clicks of a working device filled the empty room with its only sound. The walls were blank, only bearing a light blue haze. If you listened closely, you could also hear the sound of floating bubbles, coming from that very same device. DiZ and Namine turned around, looking at the young voice that called from behind. They took a long look at his change of appearance. “You’re eyes can’t lie, can they?” DiZ said. Kairi, Selphie, Tidus, and Wakka were all waiting anxiously in their classroom desks. "I wonder what were gonna do today" Tidus whispered, leaning in from his desk. "Probably go over our summer work" Kairi said quietly. "Good morning class." A woman's voiced called from afar. The four of them looked up, as heels clicked along the ground, stepping in front of the green chalkboard. It was the instructor. She was wearing long, black, boots, that led up to a black skirt, and black blouse. Attached to her collar were two wing-like flaps, laced with gold, and a maroon tie that went down the center. Her dark blonde hair was in a ponytail, with hair dropping down from both sides of her face. She fixed her glasses, and placed her hands on her hips. "My name is Ms. Trepe. I'd like to welcome you all to a new year of school." She smiled. "Today we'll begin by going over the summer assignment." The sound of shuffling books and papers filled the room, as the class pulled out their summer work. "One would suffice that Sora's fate lies in the actions of all those connected to him" DiZ said. "Are you giving me another choice?" Riku asked sternly. 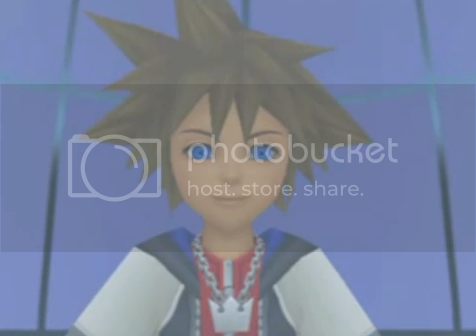 "His nobody is interfering, capturing Sora's memories as his own. Without him, Sora will not be able to awaken. 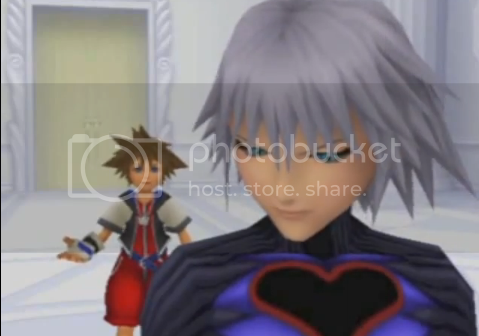 I doubt there is any choice here at all"
Riku turned around. "Where do I find him?" DiZ paused before speaking. "He is the Organization's thirteenth member." Riku stepped out, without saying a word. Tidus stretched out his arms, letting out a sigh of relief. "Ahh. Great first day" He was walking alongside Wakka, Selphie, and Kairi, down the mainland's trail. "Yeah, I guess our promise really did help!" Selphie said cheerfully. Kairi looked up at the orange sky. She smiled. “Hey…you guys go on without me.” Kairi stopped, as the others kept walking, then slowly eased to a halt, looking back at her. “Did you forget something?” Selphie asked. turned to look at Tidus, who simply shrugged his shoulders in confusion. 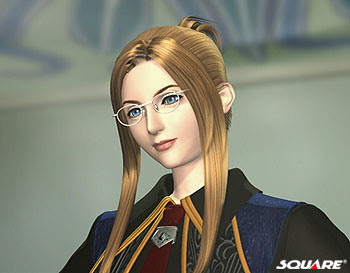 And a shout out to Quistis Trepe from Final Fantasy VIII for joining the story! This day is made up of a number of journal entries from different people, all written on the night of Day 94. Man what a day! First, we went to school like always. Then, Wakka and I played blitzball until Selphie called us over to help find Kairi. I wonder what she was doing all by herself… Anyway, we all got to watch the sunset before heading back. Man, I need to shape up. Wakka got 5 goals past me at one point! Today, me and Tidus went one on one after school. I was feeling pretty good, but our game got cut short when Kairi went missing. We were worried, but found her on the island, looking out at da ocean. We all thought it was pretty weird, but she was alright. Class has been quite enjoyable so far. Everything’s moving along smoothly, and most of the students are working very hard. There’s one student I keep noticing, though. Kairi. She always seems to be distracted by something. I asked to her to read from our textbook today, but she had no idea where we were. I might have to have a talk with her soon. I don’t know why…but I keep having this same dream, every now and again. I’m in someone’s arms. And there’s this…bright light. I can’t see anything, and all I can feel is this warmth, surrounding me. I have no idea who the person is, and before I can even try to figure out where I am…I wake up. But it’s not a sad dream at all. It’s the exact opposite. I feel so happy, and peaceful. But waking up makes it all go away. I went out to the island by myself today. Just looking out the ocean…it helped me think. Kairi was lying across her bed. She looked up, and smiled. Over at her window, she noticed all the tiny stars, shimmering in a mass array of millions, over the night sky. She smiled. She closed her journal, setting it down on the small desk next to her. She clicked off her lamp, and slowly brought her head down on her small, white pillow. She closed her eyes, falling into a peaceful slumber..
Kairi slowly stepped along the mainland’s trail. She had just gotten out of school, and was looking out at the horizon. The sky was died orange and purple, as sunset fast approached. She smiled, and turned back around. She hadn't taken notice of the man who stepping in the opposite direction from behind. After spinning around, she ran into him with a thud. Puzzled for a moment, she stepped back, then looked up at his face. His red eyes looked down without the slightest bit of emotion. "S-sorry..." Kairi said nervously. It was the man with the long black hair. Without saying a word, he merely looked back up, and continued treading along down the path. Kairi turned around, watching him slowly make his way toward the shore. Watching his red cape swaying in the wind, she suddenly realized something. Something she had been wondering for some time now. Kairi shook her head. “I’ll see you guys later” She smiled back at them, and turned around, heading in the other direction. Selphie turned to look at Tidus, who simply shrugged his shoulders in confusion. Kairi slowly made her way toward the middle of the mainland. Eventually, she made it to the grass hill where she and her friends would have ice cream in the summer. As the sun made its way into the horizon, stars began appear on the opposite end of the landscape. Kairi looked back up from her brief trance, and called out to the man, raising a hand up in the air. He was already out of sight. Kairi sighed in disappointment, slowly bringing her hand back down. "Huh?" Kairi turned around, to see Selphie in her school uniform, smiling back at her. "Hey! Wanna get some ice cream?" The two of them sat on top their usual grass hill, perched high above the small town. Kairi took a bite out of her ice cream. "I love watching the sunset like this." Selphie said. The sun was just squeezing out its last bits of light, right above the horizon. Stars began to twinkle from above, as nightfall grew closer. Kairi looked down at the ground, and paused before speaking. "Hm?" Selphie looked over at her. The stars were sparkling across the entire dark blanket now. Selphie looked up as well, gazing at the immense spectacle. “Huh?” Kairi quickly turned to look over at her. Kairi lifted her head, taking another look at the stars above. “Yeah. That’s right…” Her eyes filled with wonder. Kairi stared for a long time, meditating on what she said. Suddenly, she felt a hand on her shoulder. She looked up at Selphie, who was standing up. “Okay. I’m gonna stay here for a while, so I’ll see you tomorrow.” Kairi said with a smile. “Okay…bye!” Selphie said in return, walking off into the distance. Kairi didn’t remember how long she sat there, looking up at the night sky, wondering about what was constantly tugging on her heart. About that thing she felt was up there, but completely out of reach. But in that moment, she suddenly felt like it wasn’t as far as she thought it was. She closed her eyes, feeling the cool breeze of night gently brush against her face, running through her red hair. 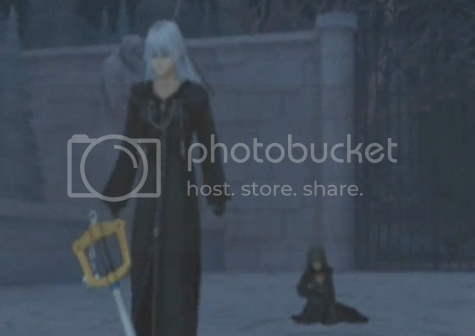 Riku stood silent, as his black coat, and silver hair swayed in the wind. He was standing on the paved road that lead to Beast’s castle. “Where is he…?” he thought to himself. Breaking his trance, he suddenly heard the clicks of footsteps, coming from afar. He turned around quickly. An organization member was stepping towards him. Suddenly the hooded figure stopped, bending its knees. Riku drew his stance, sticking his blade out toward it. Then, to his surprise, a bright light flashed from its hands, stretching out into a longer shape. As the light cleared, a keyblade appeared. Riku tightened the grip on his weapon, clenching his teeth. Still liking this story. I wonder what Vincent is doing in all of this. And what the organization's plans for Kairi are (if for anything at all). Thank you! I'm so glad you like it ^_^ More is definitely going to be revealed as the story goes on! “What am I supposed to do…” Sora sunk his head, still mulling over all the things Namine was telling him. 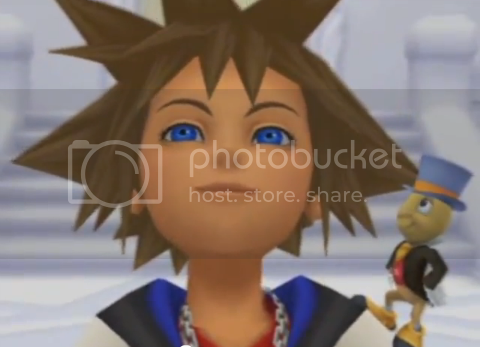 “Think, Sora. Think just one more time. About who’s most special to you…” She raised a hand, placing it on her chest as she spoke. piece of his homeland, surrounded by destruction. 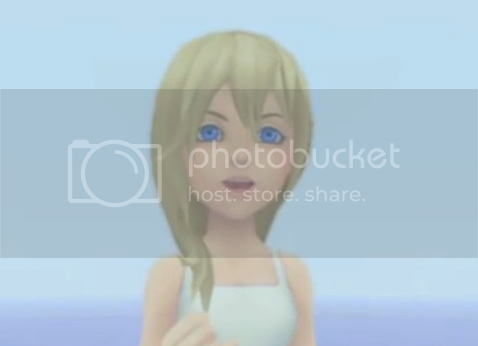 Namine lifted her head to speak. Kairi, Selphie, Tidus, and Wakka were all sitting in their classroom desks, listening to Ms. Trepe give a lesson on sunsets. She was pointing to a drawing of different rays of light, drawn below a picture of a sunset on the chalkboard. "See class…light is made up of lots of colors. And out of all those colors, red is the one that travels the farthest." The tiny scratches of lead against notebook paper filled the entire room. through the classroom window. Tiny specks of dust were slowly descending, made seen by the rays of afternoon. She sighed. 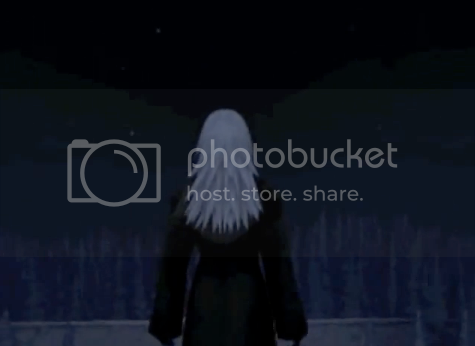 Riku stood silently, as his black coat, and silver hair swayed in the wind. He was on the paved road that led to Beast’s castle. Breaking his trance, he suddenly heard the clicks of footsteps, coming from afar. He turned around quickly, drawing out his dark blade. shape. As the light cleared, a keyblade appeared. Kairi looked over at Selphie, who smiled and nodded in agreement. They already knew they would be in the same group. She turned to her right, to see Tidus and Wakka, doing the same thing. Then, she heard the sound of a thud on her desk. She looked up, to see Ms.
Trepe, looking down at her with a smile. “I expect good things out of you four,” she said, before moving along down the aisle. Kairi looked back down, to see a small brown log lying in front of her. 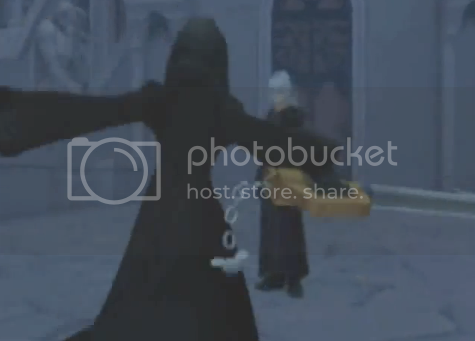 The hooded figure sprang towards Riku, immediately swinging its keyblade towards him. Raising his blade, Riku blocked the attack, pinning the two of them in a clash, as both blades gridded against each other. Sparks of light sprang out, at the loud ring of clashing metal. The two of them leaped backwards. Riku dismissed his blade, and took a step back, charging up a surge of dark aura. It was already running towards him. sparks of light erupted from it. The hooded figure looked up, to see Riku rushing toward it. 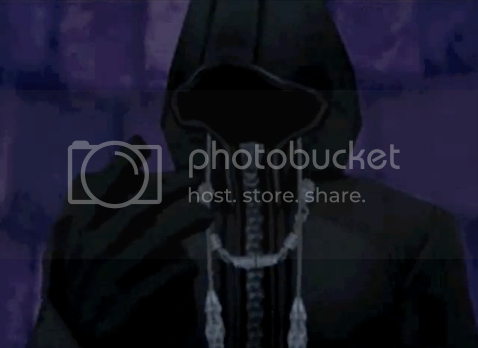 the hooded figure raised its keyblade, bobbing and weaving, dodging and blocking the sharp edge. backwards. Dropping his arms, he slowly raised his head. “Huh? 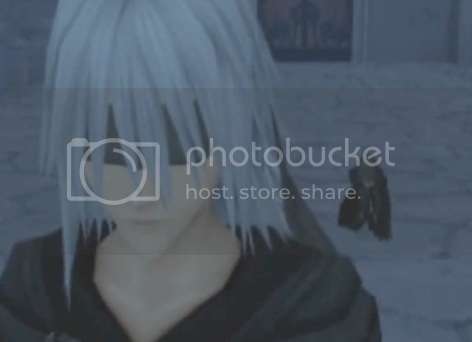 !” Riku looked shocked as he faced the hooded figure. “What? 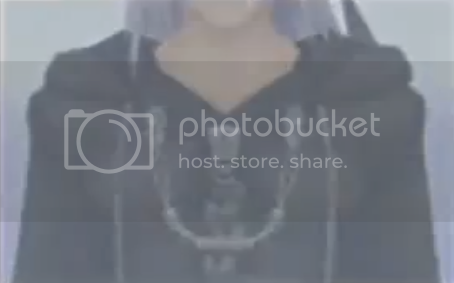 !” Riku whispered to himself in a surprised tone. He focused forward, to see it charging forward for another attack. “Eeyy…we betta get started on this quick” Wakka said, resting his hands on top his head. The four of them were all walking through the quad, toward the school’s exit. “Sure” Kairi said with a nod. “And you guys can gather the supplies, right?” Selphie said, looking over at Tidus and Wakka. “You got it!” Tidus said. “Yeah. I guess…” Tidus said, disappointed with how early it was. “Hey! No complaining about the time!” Selphie said, wagging her finger in front of Tidus’s surprised face. The four of them laughed, making their way out the exit, and along the trail that ran through the mainland. at him. “What gives you the right to say that? !” Quickly, she picked her Keyblade up off the ground, and began charging toward him. With quick reaction Riku dodged the attack, spinning around the girl, and pounding his fist into her back. She fell face down on the ground, as her Keybalde dismissed itself. Riku stood up straight, looking back down at her. “Find a new crowd. Trust me. Those guys are bad news.” He turned around, and began stepping towards the exit. He spoke without turning around. “Fair enough. You could say I am…the biggest nobody of them all. He continued on, slowly stepping towards the large metal gate. As he made his way down the paved road, the only sound he could hear through the cold, quiet night was the loud wail of the girl he had just defeated. “He was always talking about finding his friends, and going back to the islands together,” Aerith said. Kairi looked up at the night sky, as a shooting star ran by. It was the gummi ship, heading back to Hollow Bastion. “Sora…“ she said slowly. There was a long pause, as the four them looked up at the wide expanse of stars, hovering above Traverse Town. “Hmph.” Leon closed his eyes, crossing his arms over his chest with a slight smirk on his face. Kairi blinked, looking back at Aerith with a curious expression. She turned around, bringing her head down. She thought long and hard over what she was telling her. 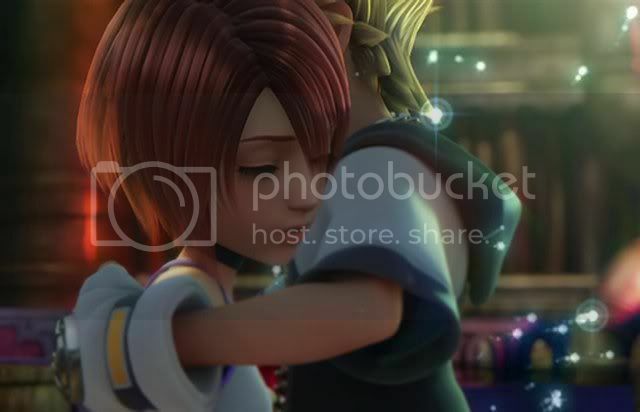 Raising her head toward the night sky, she closed both eyes, remembering the warmth she felt in Sora’s arms. She took in a long breath, opening her eyes back up, and smiling. Kairi stood on top the usual grass hill, as the light breeze of morning ran through her red hair. She was wearing her pink dress, laced with zippers, and a black hood. She could hear the soft sound of the untrimmed grass beneath her feat, swaying with the whisper of the wind. She looked out the entire mainland, as the sun's rays tinted the ground with orange, each house casting its own dark shadow on the ground beneath. Kairi looked down, to see Selphie, making her way up the hill. "Hey!" she said with a smile. "How long were you waiting for?" Selphie said as he stepped onto the top. "I'm not sure..." Kairi said. Her face suggested she was trying to remember something. Her eyes drifted downward, then back over to her. "Maybe an hour"
"Yeah." Kairi said with a nod. “Just sitting here…” Kairi said slowly, as she turned to look out at the ocean. Selphie gazed back at her with curiosity. She cocked her head slightly, with a look of confusion, then turned, matching her view with Kairi’s. "Hey!" Tidus said, as he made his way up the hill, followed by Wakka. He was holding a sundial, about the width of his chest, with a ruler set on top in his arms. Wakka was holding a long, red pole, similar to the one Tidus used to use, in his left hand. Both of them turned, slowly stepping over to them. "Is everything here?” Selphie asked. "Yeah! Where do we start?" Tidus said. "We can start here if you'd like," Selphie said cheerfully. "Sounds good" Wakka said, stepping next to Tidus, and sticking the long red pole into the ground. All four of them stood behind it, facing away from the ocean's view. As they slowly brought their heads up, they watched the rays of light creeping over the mountains scattered across the mainland. The giant circle of orange slowly rose, higher and higher into the sky, it’s warmth touching the faces of each of them. Kairi smiled, as the light reflected a twinkle into both her blue eyes. Saïx turned, looking down at the small, hooded figure looking up at him. Xion looked down at the ground, clenching her fists as the frustration insider her grew and grew behind every passing moment. “Just give me another chance!” she yelled back at him. “We can’t afford to expend any more chances on you…” He turned, stepping into the opposite direction, but stopping to release one last utterance. 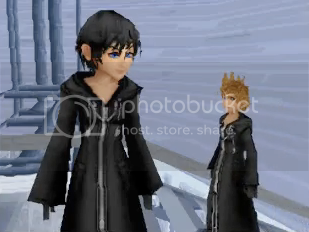 Xion stood there, both in a state of shock, and despair. She sunk her head, as the combination pierced into the space where she knew a heart would be, if she had one. Coursing through her veins, throbbing in the back of her neck. The only thing that stopped her from bursting into tears right on the spot was the sound of a soft, familiar voice, coming from behind. “Xion?” It was Roxas, slowly making his way up the stairs of Twilight’s View. 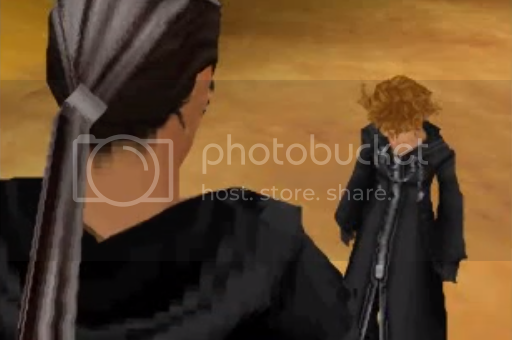 Too distraught to think of anything to say, Xion kept silent, before fleeing in the opposite direction. Her eyes were pressed tight with frustration, as her feet quickly tapped along each step of the descending stairway. She grabbed her head with both hands, clenching her teeth as the pain of uncertainty tightened its grasp on her mind. “Alright…steady…” Tidus was holding on to the sundial with both arms. His eyes were focused in carefully, as the triangular plane formed a shadow across the circular platform. Wakka was holding on to the long red pole, watching the angle of the shadow closely, before sticking it into the ground. Selphie carefully placed one end of a compass on top an edge of the shadow, slowly bringing the other end directly in front of the sun’s light. Kairi, watching only few steps away, reached into the small black pouch on the left of her waist. She pulled out the small brown log, and a small pencil. “Ready Kairi?” Selphie called out. Kairi carefully added the number 24 to a list of others, below a drawing of a triangle. “Sounds good to me!” she said in return. Kairi shut the log, tucking it away into the pouch. She looked back up, to see all three of them looking back at her. “Yeah” Kairi said, nodding her head in return. They all turned around, beginning their walk down the hill. “So, the sun’s really far away, isn’t it?” Tidus said. “Yeah! Millions of miles in fact.” Selphie said. Kairi turned, looking back at the circle of light that hid behind the hill more and more with every step. 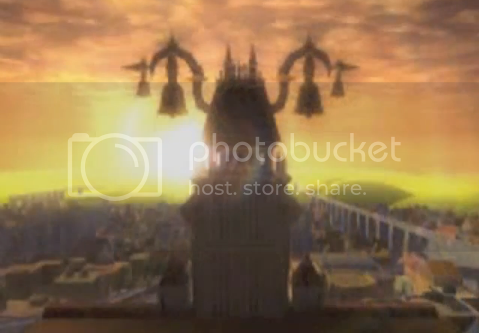 “It’s crazy how we still get all that light.” Tidus said. “We can’t ever take it for granted, ya?” Wakka said. Kairi turned back around. As the morning breeze carried through the small group, the sound of their conversation slowly faded away in Kairi’s mind. She laid a hand on her chest, sinking her head. Her heart was remembering something her mind had forgotten, and it made her wish more than anything that she knew what it was. “Pitiful…” Saïx said slowly. He was making his way down the hallway of The Castle that Never Was, on the way back from his confrontation with Xion. Turning into his private bedroom, he closed the door behind him before taking a seat on the bed, reaching into a small drawer and pulling out a journal and pen. As expected, the Duplicate is starting to show its limits. The Program showed promise, but a puppet is just a puppet: something to be toyed with until it breaks. 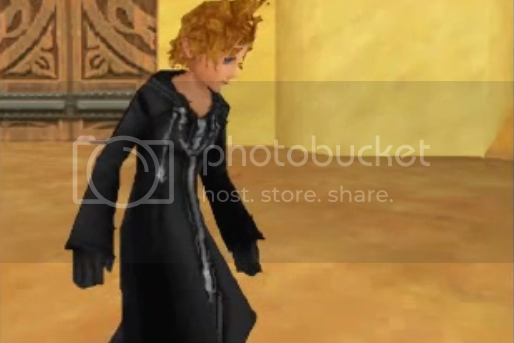 I am utterly at a loss as to what Roxas and Axel see in that thing. How best to dispose of it merits my consideration going forward. Saïx paused, bringing his head upwards to face the ceiling, then back down to continue writing. As for our plans collecting bait, consulting the will of lord Xemnas will be needed before beginning. Xion’s actions reinforce that fact with every passing day. If we can proceed, then the first step will be reconnaissance. Saïx paused before lifting his pen for the next sentence. Sora. You will be ours soon enough. “Huh?” Kairi turned, looking over at Selphie, who was staring out the orange colored ocean. Selphie took a few steps forward, stopping beside her, keeping her eyes fixed on the scenery. “It’s the assignment, isn’t it?” she said, looking over at her with a cheerful expression. 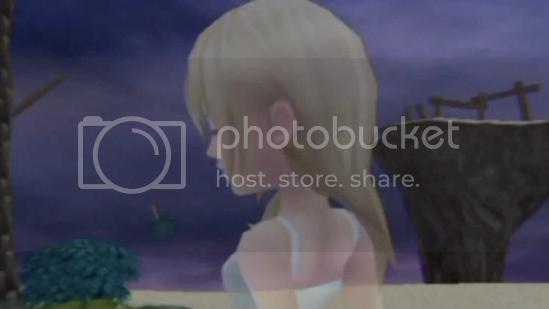 “Yeah…” Kairi said, keeping her head in the same position. She was lying, and Selphie was able to tell right away. It had been hours since they first came down from the grass hill, and the sun was now approaching sunset. They had been all around the island, and were finally coming to their last measurement. The two of them were standing on the dock, while Tidus and Wakka were setting up the instruments behind them. “Hey! We’re ready over here” Tidus called out. Kairi and Selphie walked over to where they were standing. Tidus grabbed on to the sundial, making sure it was in the right position, while Wakka held on to the red pole, making sure it was aligned with edge of the triangle’s shadow. Selphie pulled out a compass and ruler, stepping over to the sundial. Kairi pulled out the journal and pencil, ready to write down the measurement. She turned, staring out at the sunlit waters. Her hair was swaying slowly in the wind, as her blue eyes kept locked on the orange light, slowly squeezing back into the horizon. “Huh? Oh-yeah. Ready.” Kairi said, quickly looking back at the three of them. The ends of Riku’s black coat swayed with the cold breeze of night. Slowly raising his arm, he held it out as if he was reaching for something. His fist closed, as he remembered what it was like to grab on to the handle of a Keyblade. As the images of his stuggle with Xion flashed in his mind, he slowly brought his hand back in, opening it up as he looked into his palm. He reached above his head, and lifted up his black hood, revealing his face. The cold air was biting against his cheeks. Without any emotion, he simply stared out at the world of Beast’s Castle, silently. He sunk his head, letting the wind carry through the ends of his black blindfold. He pressed his covered eyelids together tightly, gritting his teeth with frustration.